It was a light week in book world for me. I chose to take mostly books I already had but hadn't yet read on vacation with me. i've actually never read this series, i've heard so many great things about it though. Holy bananas, you read a lot of books! That's awesome. Did you like the first Fever book (Darkfever)? Okay you're killing me here Alison–I'm dying to know your reaction to Dark Lover! What a successful vacation you had with all that reading:) I'm really excited for Die For Me, I've heard great things, did you like it? Looks like some interesting books there! I can't wait to read your review for "Dark Lover", "Darkfever" and "Dead Until Dark". I love the BDB series, Lover Awakened was my all time favourite. Oh wow, that is a lot of books! Great IMM! Die for Me was an interesting read so enjoy! I had Harry Potter Film Wizardry for Christmas. It's such a fantastic book, you'll love it! Ooh, nice reading! I just LOVE when I have a span of time to read. And I think I'll have to check out the Harry Potter film one. Looks interesting. Happy Reading! I loved Die For Me, it's awesome! Warm Bodies sounds good too, I'll be looking out for your review :) Happy reading! Like Jenny, I'm really curious about your thoughts on the BDB series. It's definitely a guilty pleasure of mine. Looking forward to your reviews. dang! 9 books? that's awesome. i can't wait for my summer vacation and read through my tbr pile. great mailbox this week. harry potter FTW! Sounds like you had a very relaxing vacation. Great stuff! Happy reading! Nice job with the crazy amounts of reading! And the Harry Potter book looks really great. Does it have a lot of illustrations? ARghhhh have got to buy the JR Ward series! All I hear about is how incredible it is and I need to get to it! I love that you read so many books while on vacation. That is my dream. One weekend this summer I am going to the beach to lounge in the sun and read a thousand books. JR Ward is my love (well actually the BDB is my love) so I hope you'll write a review on DL. Woah!! You've read so many books on vacation! I really cannot wait to hear your thoughts on all of them! I have been dying to read J.R. Ward series (Blood Dagger Brotherhood) and I just ordered the entire series haha! I've been hearing such awesome things about the series so I couldn't resist! Happy reading! I might check some of them out! Awesome vacation reading! I love catching up on reading when I'm on vacay. I also can't wait to read Culbertson's latest book! That is a lot of reading for one vacation!! I'm reading Die For Me now, it's taking me a little longer than I wanted to get through it thanks to my business, but I'm enjoying it. Good god, woman! I don't know if I finish 9 books a month! You are a superstar. I'm so jealous of your HP: Film Wizardry book!!! I will definitely have to pick up the Harry Potter book! I love the books and movies so much- I have already taken off July 15 so I can go see the last movie at midnight haha! I also go nuts with books on vacation...we are at the beach now and I brought a milk crate full of books with me! Ooh, you got Dark Lover. I really want to read that book, hope you enjoy it! Lol, you went on a spree indeed! Very awesome books you read. I loved Darkfever, I can't wait to read more of the series. Vacation with books are the best! My parents used to tease me because I would always bring a suitcase with clothes and another one stuffed full of books! Glad you got to have some quality reading time! I can't wait to hear what you thought about some of those romance books! I'm about halfway through the second Black Dagger Brotherhood and really am liking it. I've got the Harry Potter: Film Wizardry for Christmas but the french version ^^ it's great, there is so much awesome stuffs in there ! Enjoy it ! 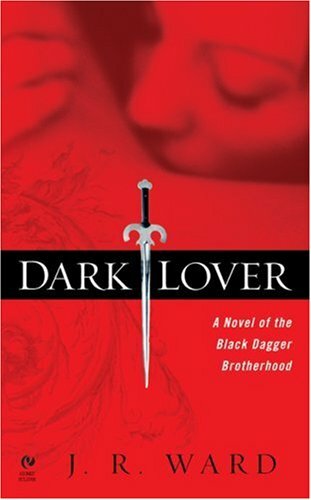 Darkfever and Dark Lover - great reads! Agh, late comment is late, but the vacation list is impressive!